If you are retailer receiving shipments from your suppliers, you can enable that all your suppliers use your parcel or carrier accounts to ship and generate labels directly in the Logicbroker portal or through Logicbroker API. If you are a supplier sending shipments, you can be both connected to your carrier/parcel accounts and your retailer's selecting one when creating the shipment. When selecting your shipping account, you will have the ability to select your carrier and service level, while using the retailer's will be restricted to what is provided on the order. When an order is placed the retailer will have 2 options for how a supplier can fulfill and print the labels. When an order includes the carrier and service level, the shipment will require that the label and tracking generated when a supplier ships uses the same carrier and service level. To make sure that you are sending a matching carrier/service level see the available ship engine maps below..
Logicbroker has the ability to choose the lowest rate carrier and service level based on the "EstimatedDeliveryDate" provided on the order. The Estimated Delivery Date will be used to determine which service levels to use and if there is no carrier (class code is blank or labeled as "UNSP") on the order, Logicbroker will pick the lowest cost shipping service based on all carrier accounts setup in ship engine. Specifically the Carrier field refers to ShipmentInfos.ClassCode on the Order. How do you ship and download labels? Start by navigating to your order list. 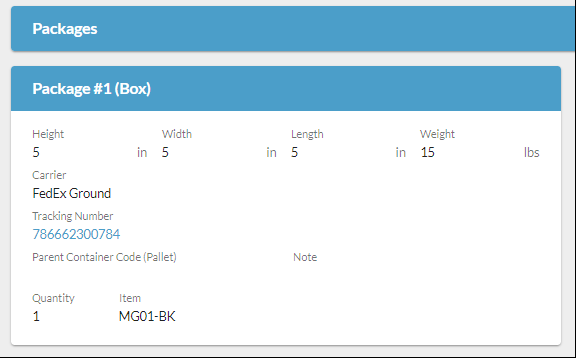 On the navigation panel Click Orders > Find an Order in "Ready to Ship" > Click View. Reviewing the order In the portal you can see Shipping Method contains "UNSP" (Unspecified) and an Expected Delivery Date (in the future). Therefore when creating the shipment label, rate shopping logic will be processed. If the Shipping Method matches a Logicbroker Standard code as shown in the table above in Option 1, then that carrier and service level will be used for label creation. Click Ship on the far right of the order. On the "Create Shipment" page you will see a dropdown option - "Create tracking labels using…"
This will only be available if the merchant/retailer has ShipEngine setup, or the supplier has a ShipEngine account setup. Selecting "another system (manual entry)" will use the standard shipping approach where the user will be required to add their own tracking and carrier details. Once a shipment is prepared with the appropriate number of boxes and item quantities in each box, go ahead and click Submit. Simultaneously, the labels and shipment will get created. You will see the Tracking Number and Carrier fields auto-populate with the data matching the label. To print the label, scroll to Attachments and click Download to retrieve the labels in PDF format. Now the shipment will process to the merchant/retailer with all required data as normal. If you are looking to use ship using your merchant's or your own carrier account, you can do so through the Logicbroker API. For more information on integrating see our developer documentation. When creating your labels you may experience an error for malformed data. 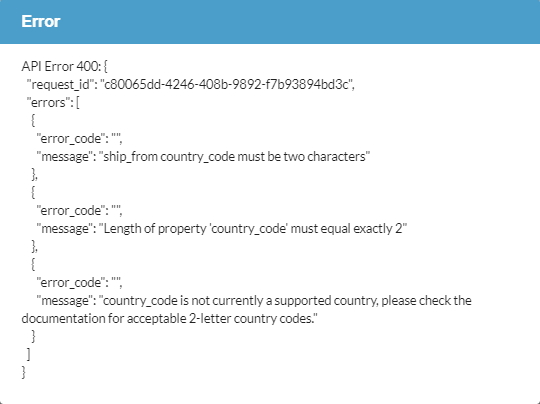 When posting labels all information is validated this includes address validation for both "Ship to" and "Ship From"
Here is an example of an error validating Ship From Country Code.